If you have a Wholesale Account, “LOGIN to My Account” to start shopping! Sell the most potent catnip toy on the market – one that brings customers across town to buy them by the handful! HOT CATS develop a loyal following of connoisseur kitties – and the people who love them. WHAT’S THE SECRET TO HOT CATS SUCCESS? Stuffed with pure catnip – no fillers – you can feel the generous 1/2 cup of herb in the single link size. The Deluxe is lavish – 1 1/2 cups of catnip in a 4-link shape that provides even more action and fun. Eye-catching design – Hot Cats come in a bright assortment of eye-catching colors, patterns, and prints, including bright stripes and florals. Your customers will love picking out the perfect one for each cat. Tough – will withstand mauling – Sturdy denim twill fabric is carefully sewn by our kitty elves. Your customers will be amazed how this toy stands up to wild cat antics. Fresh and Potent – We’re purrsnickety about using only certified organically grown #1 quality catnip leaf and flower – not the “toy grade” (sticks & stems) found in other toys. Even though our cellophane packages seal in the aroma, most cats will smell the difference right through the bag. Customer Loyalty – You’ll be amazed at the return business. Once they try them, your customers will come back regularly for new Hot Cats – and we guarantee they’ll have Hot Cat tales to tell. 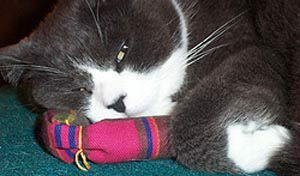 To see fun photos of happy cats and fan mail from our satisfied customers, please visit our retail site, FullCircleHerb.com. NEW – Playtime Catnip Mist with catnip essential oil. Certified organic catnip herb. Choose packaged or bulk. Looking for Hot Cats products for your own kitties or for gifts? Visit our Retail Site: FullCircleHerb.com (quantity discounts are available).